They can be filled with anything really,vegetarian delights or even sliced cold cuts, prawns,or tuna, but if you like that delicate perfumed crunch with every morsel try this recipe. Grill chicken fillets. Allow to cool and slice long strips. 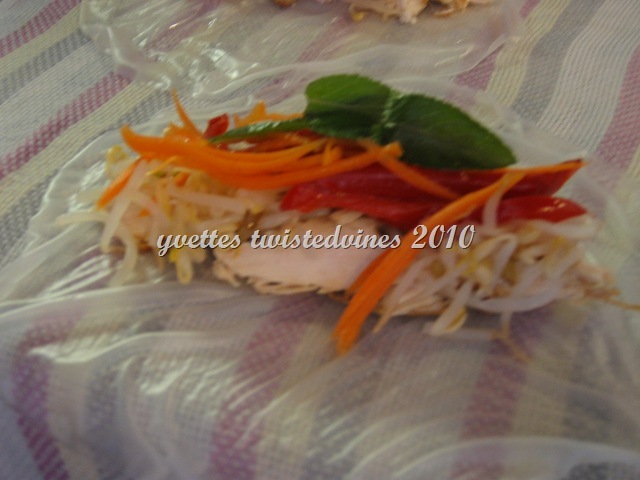 Prepare rice paper. Fill a shallow pan with water and heat for 2 or 3 minutes,turn off heat. Place a rice paper wrapper into the water until it’s soft and pliable ( about 15 – 20 seconds).Remove from pan and place under cold running water, lay flat on a damp tea towel. 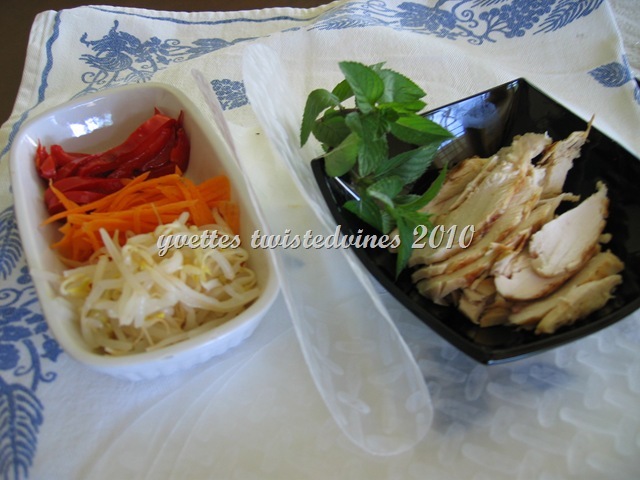 Place the filling of your choice or from my recipe, in the middle of the rice paper wrapper…grilled chicken strips,carrot,red capsicum,bean sprouts and fresh mint leaves. Fold the bottom of the wrapper up over the filling, fold in the sides totally covering the filling, then roll the wrapper upwards to form a neat roll shape. Don’t overload! 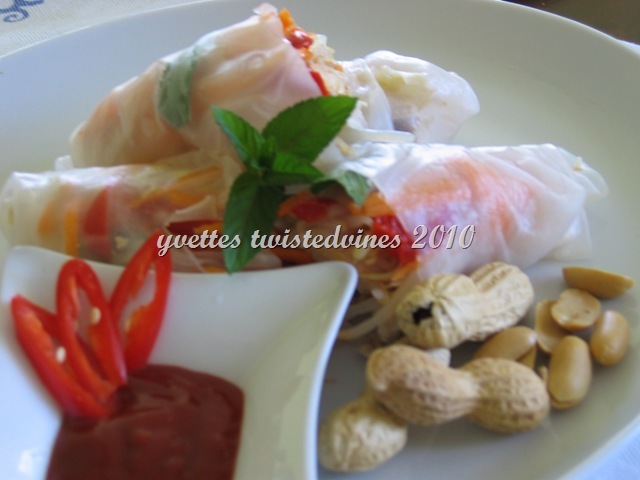 Serve immediately with sweet chilli sauce and crushed peanuts. Those look so yummy. It sounds so healthy. What a perfect rush hour healthy lunch! 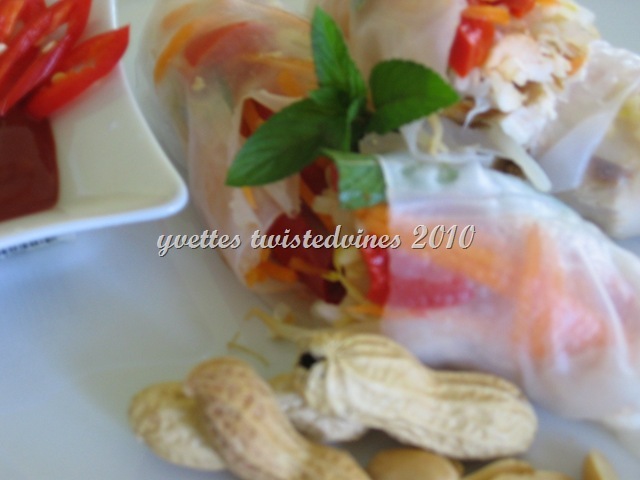 Love rice wrapper rolls! I am going to dig out my package of rice wrappers from the back of the cupboard. Thanks for sharing…it is a reminder to make another thing that I haven’t made in a long while!